Methodism was the great enthusiasm of the late 18th and early 19th Centuries, and was always strong in rural, awkward, non-conformist east Norfolk. But the labyrinthine world of the various Methodist denominations before unification in 1932 can be a confusing one. Unification itself, although no doubt a noble thing spiritually and theologically, led to a great cull of chapels which fell out of use as congregations combined, and even in remote, rural areas the buildings often fell prey to redevelopment. 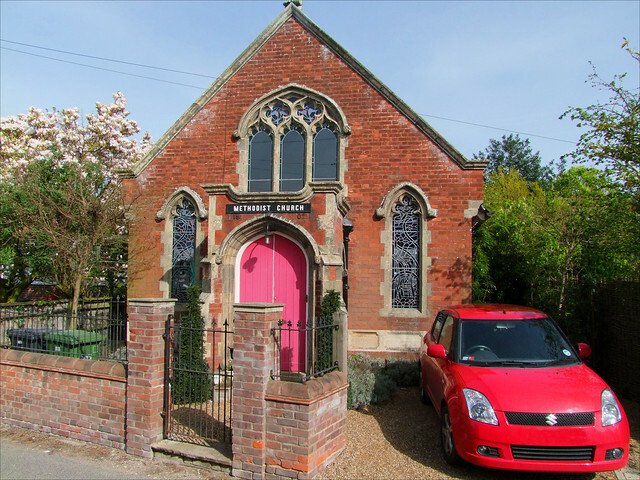 Stokesby Methodist Church was built in 1907 by the Stokesby Primitve Methodist Society with the help of funds granted by the larger Acle Primitive Methodist Society up the road. Ben Milner, in his excellent History of Methodism in East Norfolk, notes that it replaced an earlier building, but that in fact there was already a thriving Wesleyan Methodist Society in Stokesby, with its own chapel elsewhere in the village. In retrospect, the construction of this fine little structure must have seemed like empire-building, because already the Primitive Methodist Society here was in decline, and by 1922 membership had fallen to just seven people, and so this chapel closed. However, seizing their chance, the busy Stokesby Wesleyan Methodist Society bought the building for £250 and reopened it for their own worship. The chapel is a smaller, simpler version of the typical design of Primitive Methodist churches in the first decade of the 20th Century, with a large west window above the entrance portico and flanking lancets. The corners of the brickwork are neatly picked out with dressed stone. The stained glass windows are a modern addition, of course, for today this building is a private house. Most villages in the Flegg still had their own Methodist chapel after unification, but as Ben Milner records, the beginning of the end came when the chapel at nearby Filby was destroyed in the great storm of October 1987 and was found to be uninsured. The land was sold, and the community soldiered on at Runham and Stokesby, but Methodism has seen a faster decline in numbers than any other denomination in England in the last thirty years, and maintaining the two surviving chapels was unsustainable. A mark of the decline is that when Runham closed in 1986 the congregation had reduced to 15 people, who moved in with the congregation at Stokesby; however, by the start of the 21st Century there were once again just seven people left in total, and Stokesby chapel was closed and sold in 2002, the surviving members moving in with the congregation of the brand new chapel at Acle, built partly with the proceeds of selling off older chapels. And so an extraordinary period in English religious history comes towards its end.